Join on on May 4th 2014 at 10am as 'Make from Scratch' brings us gospel music and Rev. Keith Travis brings us a message. Then we will all sit together for a meal and fellowship. It will be a good time to come back and catch up! Join us on April 13, 2014 at 5pm to view this presentation at our sanctuary. This film will help you to see practical ways of expressing the love of Christ in today's world. Our local food pantry, Heaven's Manna, serves the needy families in our area in the Albany/Putney area. Some of the funding for 2014 has not been released yet and our pantry is running low on items. We are looking to get dry and canned goods that are in single or family-sized servings. Items such as any canned vegetables, soups, rice, grits, corn meal, mac and cheese. For dry goods in bags, please do not get bulk bags because we cannot break bags down for distribution. Your prayers and donations are greatly appreciated. Our ladies at WMU are collecting plastic grocery bags and making crochet sleeping mats to send to Haiti. If you have a collection of clean bags then we could use your donation at the church. It takes a lot of bags. Call us for details! Join us Thursday October 31st at 6:30pm for a fun evening with food, games, door prizes - all for free. Enjoy a safe evening celebrating Fall with us! On Saturday October 26th, we have two locations where we will host a fun time with activities and a Bible study. We have a location in east Putney, and one in west Putney. Click on the poster for more details! Phil Smith with the Baptist Mobile Health Ministry will join us on March 2 to at our 8am breakfast meeting to discuss the outreach program as they travel to those in need. Check out the Christian Index article below. We are also inviting all our VBS workers to join us for an intro meeting for our GoFish 'Gotta Move"
Click here for more info from the GoFish Guys! All church members are invited! Join us on Saturday morning, January 19th, from 10am until 11:30am as we welcome children from the neighborhood, ages 5 through 5th grade, to get together for some Bible learning, songs, crafts, and games. We can use some help from members as we extend our VBS outreach to other times of the year. Call Jenny for details. Then, at noon, we will be grilling out and inviting members of the community to come and join us. We expect each Sunday School class to have members present to help in conversation and meeting our guests as we eat together and show some love. As we found out by the mission trip to Haiti, the most effective way we can meet these people's physical needs is by getting support directly to them without using government methods. Since we cannot all travel to Haiti to help, we have resources 'on the ground' and they have dedicated their lives to reaching these people both physically and spiritually. 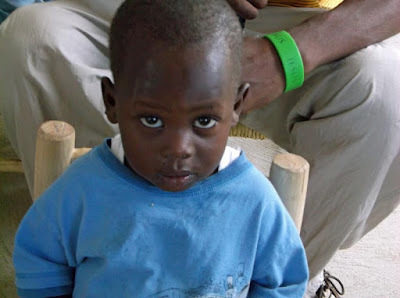 In addition to sending support through the Haiti Joy House, we also have to opportunity to sponsor orphans directly. If you are interested in helping, please contact Jenny at our office and she can fill you in on all the details.